I've only got one super deal to report from yesterday's shopping. 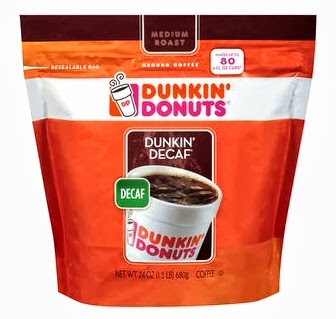 While digging through the clearance bin at Kroger, I found a 24-ounce bag of Dunkin' Decaf marked down to $7.99. The tag says that the regular price was $15.99. The marked down price works out to what I generally pay for Community coffee when it's on sale, which is $3.99 for 12 ounces. I tried some this morning and I really like it. It has a very smooth flavor with caramel undertones. Since it's decaf, I can drink it every day, if I like. I try not to drink regular coffee more than two or three times a week so that I don't get hooked on the caffeine. Caffeine affects me in a strange way so I prefer to drink decaf. Regular coffee makes me feel drowsy and foggy-headed. Unfortunately, I can't get decaf Community coffee in medium roast, which is why I buy the regular kind. I added a new quick and easy recipe to my main site today: Microwave Eggdrop Soup. I made another all-time favorite for dinner today. This recipe is originally from Sandra Lee's "Semi-Homemade" TV show on Food Network but I've made a few changes. In fact, I don't make it exactly the same every time. This time I threw in a whole 16-ounce bag of Parade Oriental Blend frozen veggie mix. It's a mixture of French-cut green beans, onions, mushrooms and broccoli. I also put in about half a bag of frozen bell pepper and onion blend. That has green, red and yellow bell peppers in it and they're cut into strips. I'm not even sure how much chicken I used this time. I had a large package with about 10 boneless thighs. I'm sure that we'll get at least six servings with all the chicken and vegetables that are in it this time. The chicken gave off a lot of juices which made the sauce a little thin. So, I added 1/2 teaspoon of xanthan gum to thicken it up and it came out just right. The brand of red curry paste that I buy is from Thai Kitchen. It seems to be the brand that all the stores sell around here and it's very good. I have no trouble finding it at Kroger and Walmart. I cooked some rice for the guys to have with their curry and I just put mine in a bowl and ate it with a soup spoon. I didn't want to miss any of the yummy sauce. Click here to see my version of the recipe. Kroger is having one of their "mega sale events" this week where you get $5.00 off any five specially marked items throughout the store. Most of the time they don't have five items that are worth buying but this week they do. Besides buying 3 boxes of cereal for my son, I got 18 eggs for only $1.24 after the dollar off and my senior discount. I also got an 8-ounce block of Kraft cream cheese for 99-cents. Kroger also has their cottage cheese for $1.99 ($1.79 with my discount) and butter for $1.77. I got two pounds of the butter for $1.59 each after my discount. I got a 16-ounce bag of Kroger shredded mozzarella and a 16-ounce chunk of colby cheese for $2.59 each (sale price is $2.88). 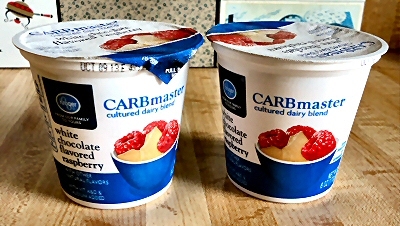 It wasn't on sale but they had my favorite White Chocolate Raspberry CARBmaster yogurt in stock. My store doesn't usually sell that flavor so I have to go to a different Kroger when I want some. It looks like they're filling in that space with the White Chocolate Raspberry while they're out of the Blueberry Muffin flavor. That's just fine with me. Community coffee is on sale again this week, just when I'm nearly out of my current stash of it. Funny how they time the sales around how quickly I use mine up. I only drink coffee about three times a week so a bag lasts me quite a while. Anyway, it's $3.99 per bag at Kroger this week and I had two $1.00 off coupons. So, the two bags that I bought were only $2.99 each. I like to keep whey protein powder on hand to make shakes for myself for times when I'm short on low carb options in the fridge. I was out of it but they had a $3.00 coupon for Body Fortress brand in the Sunday paper this week. Luckily, Kroger has the Body Fortress Whey Isolate on sale this week because even with the coupon it would have cost over $20. I only buy the whey isolate because Body Fortress's regular whey protein now has way too many carbs per serving. The whey isolate is normally $25.99 at Kroger. This week it's on sale for $20.79 so I paid $17.79 with my coupon. Last week Kroger had boneless chicken thighs on sale for $1.77 pound but they were out of them the day I shopped. So, I got a rain check and bought them today. I splurged on a little treat at Walmart today. It's been a while since they've had it in stock so I picked up some Smithfield jowl bacon. You can read my review of it HERE on my main website. It really isn't terribly expensive for bacon but it's still an indulgence that I don't buy often. It's $2.88 pound which is quite reasonable for such good, smoky bacon. Yesterday I made myself a low carb pizza and it came out wonderful. I topped it with a full 8 ounces of shredded mozzarella, pepperoni, Italian sausage, fresh mushrooms, bell peppers and onions. As I mentioned the other day, I did make an extra crust with the rest of the cream cheese and it's in the freezer for another day. Today when I got back from shopping, I made a big bowl of BLT "Potato" Salad with a few tweaks. I didn't put any bacon in it but I did put most of a 10.5-ounce container of halved cherub tomatoes. I also put in 8 hard boiled eggs instead of the three that the recipe calls for. I like to make my veggie salads double as main dishes when I can by adding extra protein to them such as eggs or ham. A big serving of this salad makes a very nice lunch and it's one of my favorites. I only got a few goodies this week. Food Town had 24-ounce packages of thick-cut bacon for only $4.99. I'm baking the second batch of it in the oven as I type this (see Oven Bacon). The guys are enjoying the first batch. I also got two packages of shredded mozzarella cheese for the Deep Dish Pizza I'll be making tomorrow. Those were on sale for $1.77 each. Since it takes only half a package of cream cheese to make the crust, and I don't know what else I'd do with half a package, I'm going to make two crusts and freeze one for another time. I also couldn't pass up a nice head of cauliflower for only 99-cents. I'm thinking about making BLT "Potato" Salad with it but I'll have to wait until after I do my Thursday shopping and get some grape tomatoes and a red onion. HEB still had their canned pizza sauce for 55-cents each so I bought three more of them. They also had a deal on ribeye steaks for $3.97 pound if you spent at least $10. I got a package of three which we're going to have for dinner tonight. 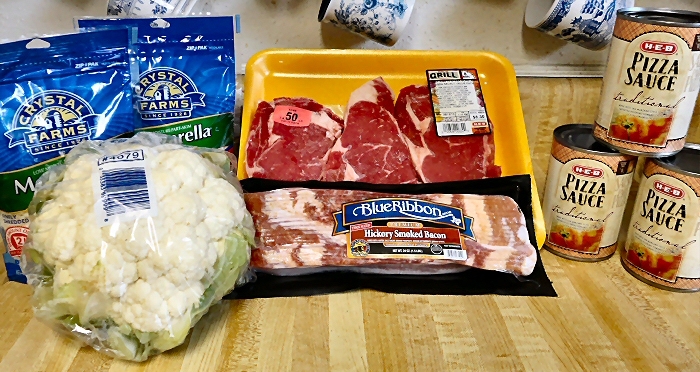 It would have been nice to have the cauliflower salad with the steaks but I had no idea until I got home what I was going to make with it or I would have bought the tomatoes and onion this morning. 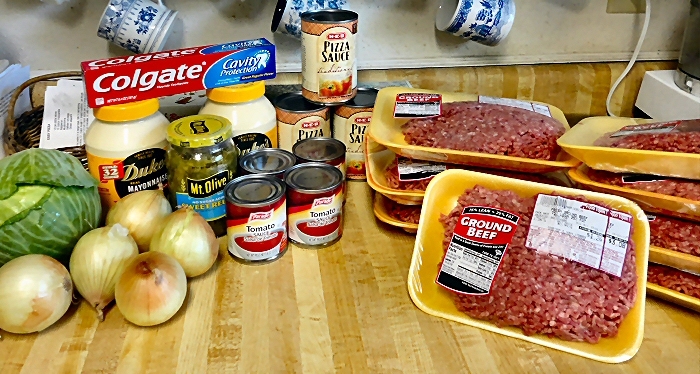 Once again I found a lot of ground beef marked down to 99-cents pound at Food Town this morning. As I type this, I'm in the process of cooking hamburger patties in my Nuwave oven. I can only cook three at a time so I have to keep running to the kitchen to put in the next batch. I bought 12 pounds so I got 24 half pound patties which I will freeze and then have for my breakfasts. One thing I like about cooking my burgers in a foil-lined pan in the Nuwave oven is that I can spoon the drippings back over the burgers before I freeze them. What I do is chill the fat until it starts to firm up and then spread some on each patty before I freeze them. The extra fat keeps the burgers from drying out when I reheat them in the microwave later. It's also nice to dip each bite into some of the fat as I eat my burger. Food Town had Duke's mayonnaise on salefor 99-cents because it's going to expire in October. I don't know if I'll use it all by then but I'm sure it will be fine for a while longer than that. It wasn't on sale but I got a jar of Mt. Olive sugar free sweet relish for $1.54 after a 75-cent coupon. They also had 8-ounce cans of store brand tomato sauce 4/$1.00 so I bought four. Some other good stuff from Food Town was a tube of Colgate toothpaste on sale for $1.33 or 58-cents after my 75-cent coupon. Cabbage was .29 pound and onions were .39 pound. I only got one nice deal at HEB today but it was a great one. I needed pizza sauce to make a pizza for the guys tomorrow but I'd never bought it at HEB before. While looking at the different kinds they had, I noticed that their store brand canned pizza sauce was on sale for just 55-cents per can. There was a tag on the shelf that said they were normally $1.50. I bought three cans so I hope that it tastes good. I don't think I could make my own pizza sauce that cheap and Walmart's Great Value sauce is a dollar for a 14-ounce jar. These are 15-ounce cans.